This well documented canvas was commissioned from the artist by the Abbot Terray, minister to Louis XVI. 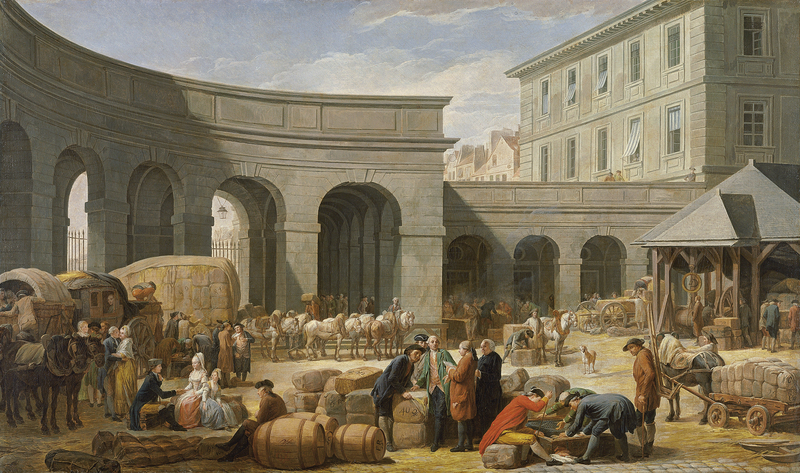 The Abbot also ordered a pair to this composition entitled The Market Square (Le Halle), now in a private collection, completed by Lépicié four years later in 1779. The present canvas was exhibited in the 1775 Salon where it was well received by Diderot who praised its imaginative composition and its colouring. Diderot also noted that the central figure in the green frockcoat was the painter himself. 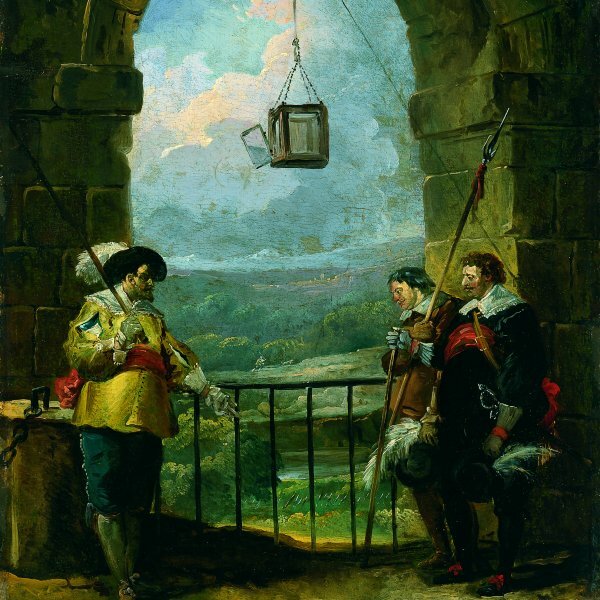 The canvas was auctioned at the posthumous sale of the Abbot’s collection with its pair, and both successively entered the Ménars de Marigny, Clos and Tarade collections. In May 1874 the latter donated the pair to the museum in Tours, a donation cancelled by his widow in 1881 and the two reappeared on the art market that year. The paintings remained together until 1893, at which date they were with the Galerie de l’Universelle. In 1903, however, at the sale of the Lelong collection, we only find a reference to the present canvas. The last owner of this canvas before it was acquired for the Thyssen-Bornemisza collection was Baron James de Rothschild. The present canvas, which is signed and dated 1775, is a mature work by Lépicié. The artist organised its much admired composition through a large open space enclosed on the left by a curved portico of solid arcades and a small gallery whose interior houses the offices of the Customs House. The space in the middle of the courtyard is filled with bundles, bales and barrels loaded onto wagons and lying on the ground. Between them we see the wagon horses and figures, the latter arranged in groups and waiting or examining the merchandise, for example, the group of figures in the foreground who have opened a case of books. Others are supervising the bales, checking seals and documentation, as in the central group. The activity taking place in the courtyard, in which the artist depicts the everyday tasks of the customs officials, seems to be a realistic portrayal of the work of this government department although in Lépicié’s version the Abbot Terray himself, dressed in black and standing behind the man in the red frockcoat, is personally supervising the work. The harmonious chromatic range is broken with saturated touches of reds and greens in the clothes of some of the figures. Two preparatory drawings for the painting are known: one of the entire composition that is in the collection of the Thyssen-Bornemisza Heirs, having been acquired at the same auction as the present canvas, and the other of fourteen figures in the James de Rothschild collection.